Dates and Venue 27 - 29 March & 2 – 5 April 2014, 8pm (2pm matinees on 30 March & 5 April 5, 2014) | BlueShore Financial Centre at Capilano U. When the Man in the Chair drops the stylus gently onto the black vinyl, his nondescript apartment is magically transformed into a glitzy theatre stage. The show filches the old ‘freeze-frame’ device where actors remain perfectly motionless whenever the Man in the Chair interrupts the record playing to dole out clever chitchat. Student productions are renowned for performers having as much on stage as the poeple sitting in the audience. 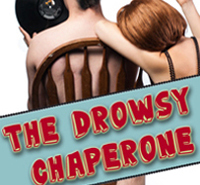 This mounting of The Drowsy Chaperone, directed with a sure touch by Gillian Barber, doesn’t seem to be an exception. The show is really a parody of American musical theatre that Broadway is famous for. The production uses pretty much every corny cliché that one might expect like: over-the-top production numbers, counterpoint duets, romantic moonlight in the middle of the day and of course, breaking into song in the middle of a conversation. The musical’s premise is charming in its simplicity. Broadway star Janet Van De Graaf (Kate Blackburn) and her besotted fiancé Robert (Stuart Barkley) are the whimsical lovers, who end happily in predictable fashion. Janet deciding to quit show business and get married means trouble for impresario Fieldzieg (Benjamin Purych), owner of the Feldzieg Follies. He has promised the producers to have Janet in his next show, so he tries to sabotage the wedding. Then there is the frequently inebriated chaperone (Paige Fraser) whose job it is to safeguard Janet’s virtue until the actual wedding. This improbable production works due to the efforts of a rambunctious young cast of theatre arts students, who have pulled together an ambitious and high-spirited show.